One of the Inserts that was included in the Japanese single boxes which clearly shows the presence of the two factions. As briefly mentioned in the introduction about the Battle Beasts the Japanese Beastformers were divided into the two factions known from the Transformers; Cybertron (Autobots) and Destron (Decepticons). Please scroll down for the actual division of the various series of Beasts over the two factions. Firstly shown and explained is the origin of this division. While this explains the large majority of the division, namely that ALL the reptiles, fish and amphibians from Planet Beast are Decepticons it does not explain everything knowing there are a couple of exceptions. But looking into the storyline of this episode again those exceptions can be explained relatively easy. With the Spider having its own order within the animal kingdom it is not very strange to find him amongst the Decepticons as well knowing the Autobots are mainly composed out of endothermic vertebrates. The Bat is a more clear exception that might need a bit more clarification. Most likely the Bat joined the Decepticons as well in order to have a flying Battle opponent in both factions with Colonel Bird on the Autobot side and Blitzkrieg Bat on the Decepticon side. This division of the flying Beasts seems to have continued amongst the Series 2 and 3 Beasts as well both having an equal amount of flying Beasts. 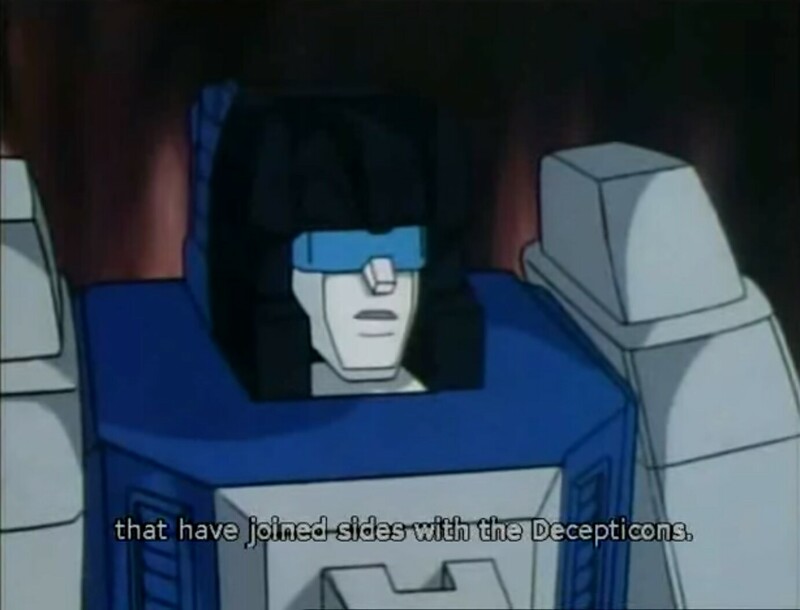 This still does not explain why Beasts such as the Armadillo, Anteater and Pangolin for instance have joined sides with the Decepticons so that is a blank that remains. 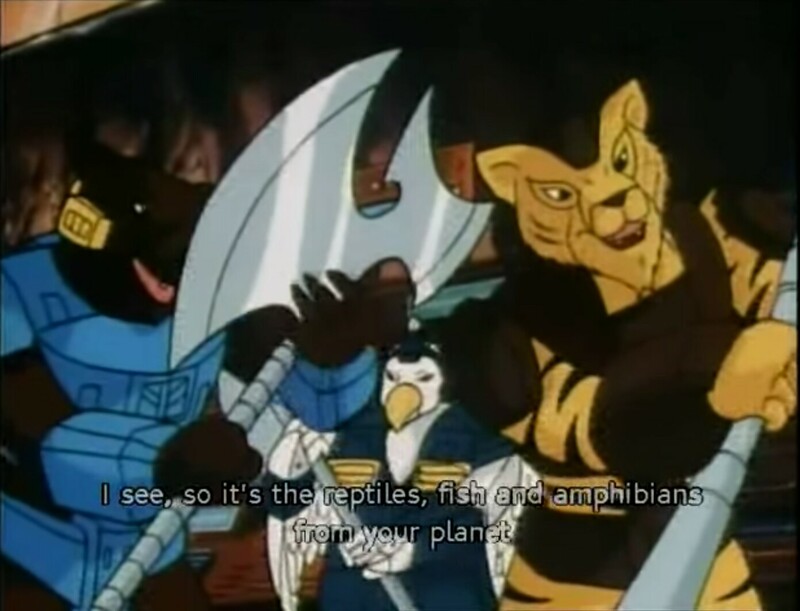 A possible explanation for those type of animals might be that they are known for digging holes and that within the storyline of the episode the Decepticons seem to operate from an underground factory. Also in order to clarify this unfair division the storyline of the Rebellion on Planet Beasts cannot be ignored. Looking at the episode it is directly clear that from the large majority of various Autobot Beasts appearing within this episode only a few are present as duplicates while on the Decepticon side there are larger groups of Bats, Carps, Toad, etc. are found. This might explain the reason for the division as is since the Decepticon army consists out of a multiple amount of the same Beast while on the Autobot side there is a bigger variety of Beasts that occur only in smaller numbers balancing the whole division idea. 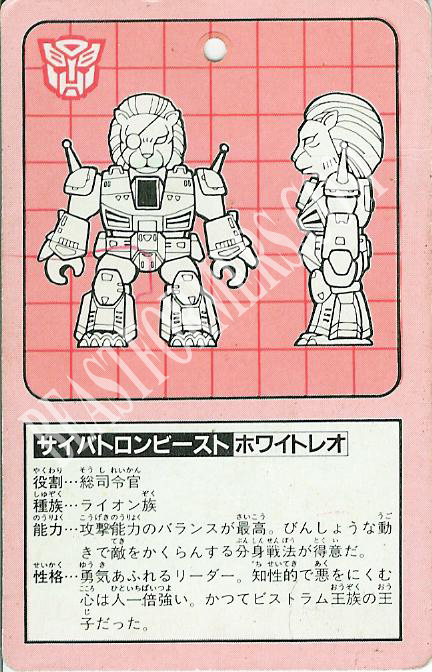 It is clear that with the appearance of the Beastformers in the Transformers The Headmasters episode TAKARA had created an even wider platform for the launch of the Beasts within Japan. 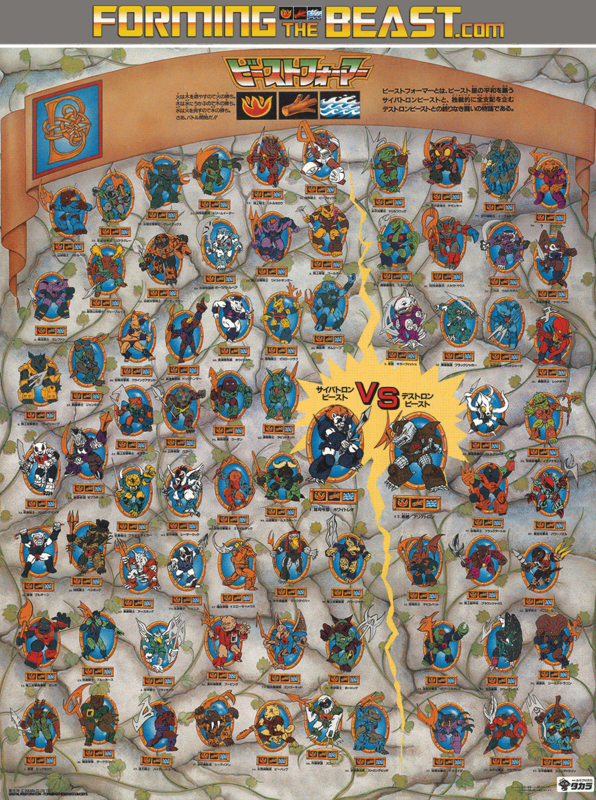 As explained in the Battle Beasts introduction the connection of the Japanese Beasts with the Transformers was much more obvious compared to the Battle Beasts released by HASBRO where the reference or connection to the Transformers line was completely absent. In Japan the symbols of the Autobots and Decepticons even appeared on some of the Beastformers packaging and cards as explained below. And also on the Japanese Beastformers Poster the division of the Beasts was clearly shown. 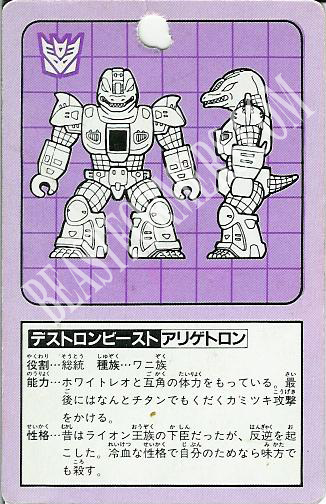 Included in most, NOT ALL (some contain another type of card), of the Japanese Autobot/Decepticon marked boxes were the Individual Character cards which were also clearly inspired and in the same theme. 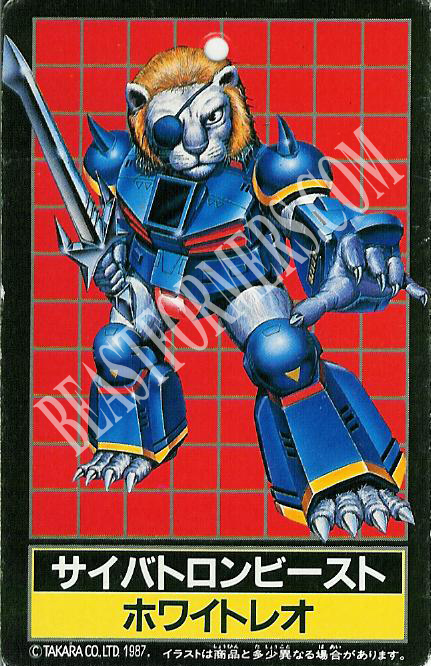 On the Left you see the Autobot Card design for Pirate Lion (White Leo) who is the leader of the Autobot Beasts. On the front side you notice directly that the design of the card matches with the color of the box but as mentioned this is not a guidline, as far as the boxes go, since these red colored Autobot cards are also found in the Green boxes with a Autobot logo on it! 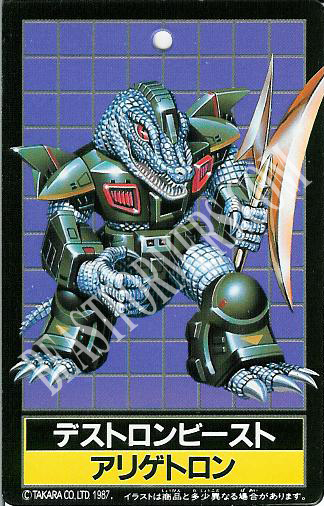 Same goes for the Decepticon Style cards as shown on the Right with the leader of the Decepticon Beasts on it; Gruesome Gator (Alligatoron). Also here the background color of the front cards as well as the purple color on the back is a returning element for the Decepticon cards whereas the color of the box seems to be a variable factor. Just like the Autobot Cards the symbol of the Decepticons is clearly shown in the left top corner on the back of the card making more than clear this is a Decepticon Beast!